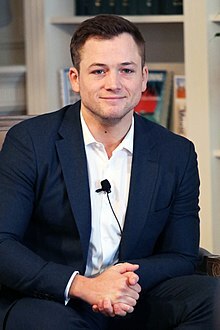 Taron David Egerton was born on 10 November 1989 in Birkenhead, Merseyside, to parents from nearby Liverpool. His grandmother is Welsh. His first name is a variation of "taran", which means "thunder" in the Welsh language. His father and family ran a bed-and-breakfast and his mother works in social services. He spent some of his early childhood on the Wirral Peninsula, and moved with his family to Llanfairpwllgwyngyll, on the Welsh island of Anglesey, where he went to primary school. ↑ "Meet Taron Egerton: 12 Things to Know About the 'Kingsman' Breakout". Yahoo Movies. Retrieved 16 April 2015. ↑ Owens, Dave (4 January 2015). "'A star is born' – Welsh actor Taron Egerton receives the Seal of approval from Hollywood Bible Variety". Wales Online. Retrieved 6 September 2015. 1 2 Howell, Jordan (12 April 2013). "Jamie Bamber, Jodie Whittaker for Sky1 drama 'The Smoke'". imediamonkey.com. Archived from the original on 21 May 2014. Retrieved 1 February 2014. 1 2 3 Kroll, Justin (25 July 2013). "Matthew Vaughn Eyes Newcomer Taron Egerton for 'Secret Service'". variety.com. Retrieved 26 January 2014. ↑ Taylor, Ben (4 March 2015). "5 things about... your new British crush Taron Egerton". Swide. Retrieved 15 September 2015. 1 2 3 "Taron Egerton on The Jonathan Ross Show, said starting at 0:52". YouTube. 25 January 2015. ↑ "Meet Taron Egerton: 12 Things to Know About the 'Kingsman' Breakout". Yahoo!. 13 February 2015. ↑ "Egerton's bio as of December 24, 2014". ↑ MR PORTER. "Mr Taron Egerton". Mr Taron Egerton - The Look - The Journal - Issue 199 - 13 January 2015 - MR PORTER. ↑ "Taron Egerton, UK Stars of Tomorrow 2014". screendaily.com. ↑ Celebretainment, By. "Taron Egerton idolises Colin Firth". Green Valley News. Retrieved 2017-09-17. ↑ Ge, Linda (13 February 2014). "Taron Egerton, Colin Morgan and Alexandra Roach Join Alicia Vikander in 'Testament of Youth'". upandcomers.net. Retrieved 16 March 2014. ↑ Scott, Mike (November 11, 2015). "Kevin Spacey's 'Billionaire's Boys Club,' WWE Studios' 'Brothers Blood' headed for New Orleans shoots". nola.com. Retrieved December 11, 2015. ↑ "50 Best Dressed Men in Britain 2015". GQ. 5 January 2015. ↑ McNary, Dave (2018-04-19). "Taron Egerton to Play Elton John in Biopic 'Rocketman' at Paramount". Variety. Retrieved 2018-08-24. ↑ "Elton John Biopic 'Rocketman' Shifts Summer 2019 Release Date". Billboard. Retrieved 2018-08-24.